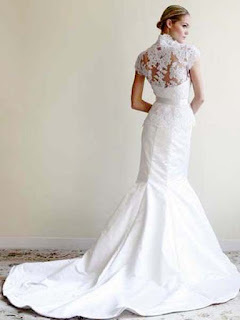 ellehermansen: My Prediction of Kate Middleton's Wedding Dress! Will you be up to watch the Royal Wedding? Ellemusic: A Long Time - New song! Rumble In Rhodos - Soft Insulated Days! Lucky Number 7 Months! Already?! 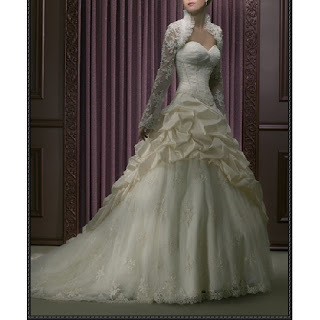 My Prediction of Kate Middleton's Wedding Dress! Will you be up to watch the Royal Wedding? It's the night before and I am so excited about this wedding - as if it was my own child getting married, or perhaps me! I feel nervous for the princess to be, as I feel I can relate to her so much. First of all she will have the huge cathedral veil which is a given. I believe her hair will be up, perhaps in a high proper - big bun. The neck would go up like this - but with buttons down the back and long sleeves in lace or solid. Back with silk buttons idea. I also see it with a little cupping on the shoulders, but a form fit to the arms. Also, high frill for the neck (but not too frilly or much at all), even though I see it high up in the neck like a turtleneck but open in the front from the neck going into a sweetheart cut (see photo below). I think Kate could rock a dropped waist for her long torso - so I see a corset fitting to the dress but perfect enough in fit, because it's obviously made just for her. Then, like I said, the little buttons down the back. The dress will go out like Princess but not too poofy like prom dress styles - or just bad wedding dress styles. 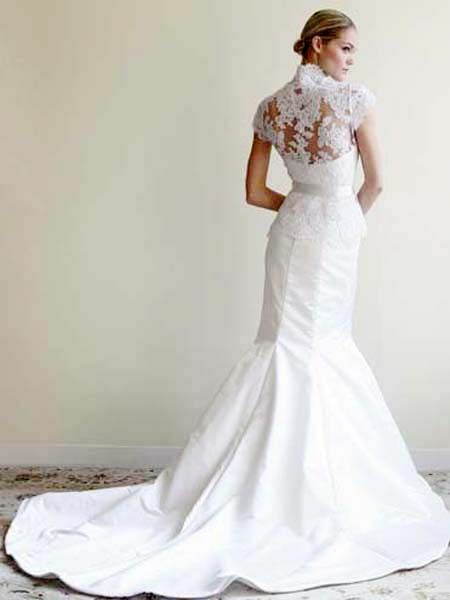 A beautiful big-gown transition. Like a nice flow to big - if that makes any sense? The dress below has way too much stuff going on, but with cleaner, classier lines would be great - but it's the best way to explain my idea. This dress is too busy/messy but it's the closest I could find to my open turtleneck/sweetheart top explaination. The top also could come in more like this, to hide more skin, respectively. There will also be a lovely and extremely long train (of course!). For jewelery - I see deep blue tear-drop sapphires (if not - straight up diamond tear-drop earrings) and gold pieces to match nicely with her engagement ring. I don't think she will go over the top - but enough to show she is going to be crowned a princess. Will you be waking up early to watch the Royal Wedding?